That chair is so freakin' cool! 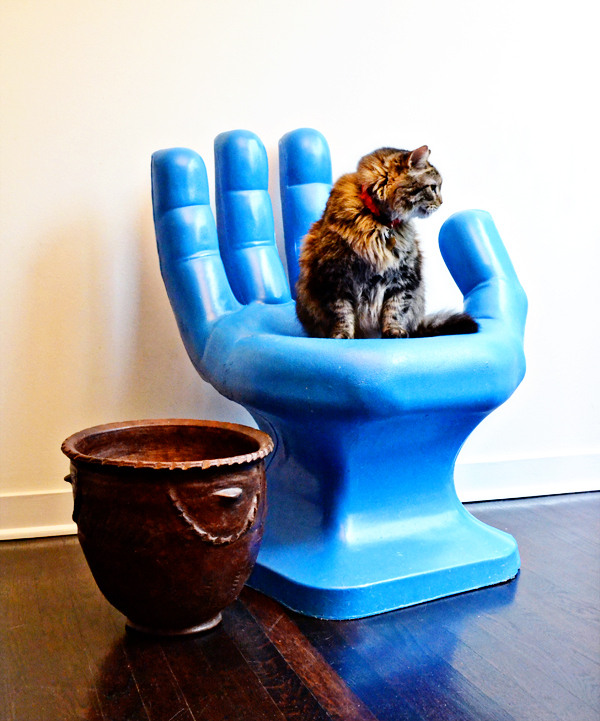 Blue chair with cat and pot ..
Smokey looks so good in that blue ! I had this visual in my head, suddenly, of the hand chair pitching The Cat like a fastball out the window - to the sound of a long, diminishing Meeeeeeeooooooooooowwwwwwwwww. Then the cat lands (with no problem - cats always land on their feet - and all that long fur would act like a parachute anyway), marches back up the stairs, rings the door bell (this is a fantasy, don't forget), you let him in, and he runs up to hte hand chair and breaks off a finger. then he curls up in the palm and goes to sleep.